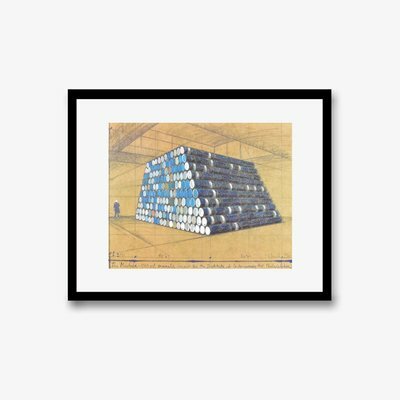 You would like to be informed about Christo's new arrivals in advance? Register now for free! Christo was born on 13 June 1935 as Christo Wladimirow Jawadesch in Gabrowo, Bulgaria, into a family that was highly interested in art. His mother was general secretary at the National Academy of Arts in Sofia until she married. At the age of six, Christo, whose talent was fostered by the family in his early years, received first painting and drawing lessons. During his teenage years, Christo experimented with large panels in his father's chemical factory. Chriso took up studies at the National Academy of Arts from 1953 to 1956 after the war. Afterwards, he travelled to Vienna via Prague, where he studied at the Academy of Fine Art for one semester. In March 1958, the young artist continued his journey to Paris. During his first years in Paris Christo visited many exhibitions and museums and introduced himself to the art of Joan Miró and Jean Dubuffet that had a lasting impact on him. 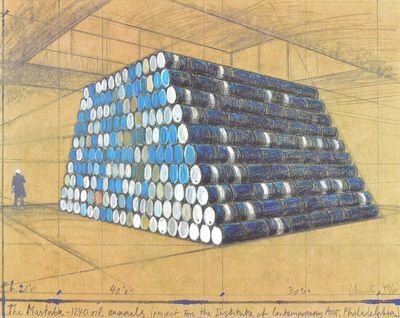 After he had kept his head above water by painting portraits during the first years, Christo started to wrap objects - a step that was to become defining and crucial for his art. He first attracted attention with his artwork Verpackte Dosen und Flaschen that he wrapped in canvas soaked in resin, corded, and then treated with paste, varnish, sand and car paint. By doing so, he attracted renowned artist colleagues' attention, such as Niki de Saint Phalle and Jean Tinguely who visited him in his atelier in Paris, for the first time. Jeanne-Claude was born on the same day as Christo, on 13 June 1935, in Casablanca. She spent her childhood with her father's family and her mother in France and North Africa. In 1952, she completed her studies in Latin and philosophy at the University of Tunis with honor and, subsequently, started to train as flight attendant at Air France. In October 1958, Jeanne-Claude met the young artist Christo, who came to make a portrait of her mother Précilda, in the house of her wealthy adoptive father, General Jacques de Guillebon. Shortly afterwards she left her husband, with whom she was married for only a couple of weeks, and entered into a relationship with Christo. Soon afterwards their son Cyril was born. In 1961, the couple started their first joint art project. In a street in Paris they built up a wall made of oil drums referring to the cruelty and inhumanity of the building of the Berlin Wall. The fact that Jeanne-Claude was - or partly still is - reduced to the role of an organiser or press spokeswoman or, at best, her partner's muse is due to an art historiography with a male connotation. In fact the couple's division of labour was, which both emphasised again and again, of symbiotic nature. The couple married on 28 November 1962. In spring 1964, Jeanne-Claude and Christo relocated from Paris to New York. The couple had to live in the city illegally until they were granted a Green Card in 1967. In the subsequent time, the two artists' large-scale and spectacular projects made them known to a wider public. Christo and Jeanne-Claude designed their large-scale projects together and realised them independently in spite of the huge expenses. They neither accepted orders nor donations and subventions, but funded their auctions by selling drawings, prints and editions that display the planning status during the design phase continually. In 1968, Christo and Jeanne-Claude participated in the documenta IV in Kassel with a balloon with a volume of 5600 cubic metres. The couple recorded the elaborant process of the building, first failure, and re-building in a volume of photographs with the prosaic title 5600 cubicmeter package. In the following year, Jeanne-Claude and Christo covered together with more than 100 helpers a shoreline of the Australian coast. 93,000 square metres of artificial fabric and 56 kilometres of rope were installed in the course of this. After the couple's plans had been discussed controversially, the project was well received after its completion and established the artist couple's international renown. In 1970, the preparations for the Valley Curtain project began. In a 400 metres broad valley in the Rocky Mountains in the US state Colorado the couple planned to span a curtain with a height of 111 metres. Wind and the crag caused the artist duo considerable problems, so that the curtain was tattered on the first attempt. In August 1972, they eventually managed to install the curtain successfully for a period of around two days. 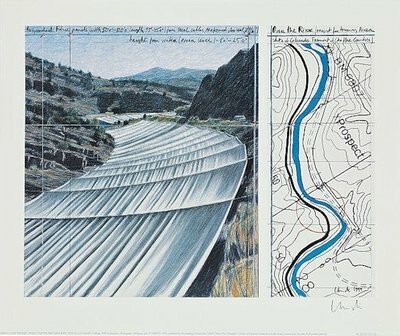 In 1973, Christo was granted American citizenship. In the same year, the preparations for the project Running Fence began, which consisted of a fence made of more than five metres high panels that was supposed to run through the California landscape on a length of 40 kilometres. The project went along with significant legal and bureaucratic effort as well as considerable persuading from the artists, but could be finished in summer 1976. 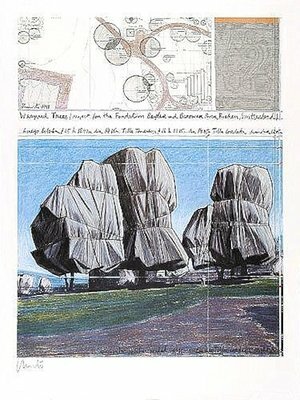 Christo and Jeanne-Claude realised the by then most sensational project in Europe in their home in Paris. After negotiations with the Parisian Mayor Jacques Chirac that went on for 9 years, the artist couple got permission to wrap the oldest bridge in Paris, the famous Pont Neuf, in 1984. More than 40,000 square metres of sand-coloured polyamide fabric were utilised in the course of this; more than 3 million people visited the French capital during the project that lasted one month in order to attend this unique event. Three years after the wrapping of the Reichstag Christo and Jeanne-Claude realised their next spectacular large-scale project at the Fondation Beyeler park in Riehen near Basel: they covered 178 trees of the park with the help of silver-grey polyester fabric and thus created a shimmering, translucent sea of impressing aesthetic impact. In this case the couple funded their project mainly by selling editions, too. All materials were recycled. In 2005, the The Gates project at the Central Park in New York followed, which altogether consisted of 7503 gates that were draped with saffron panels. The expenses also amounted to enormous sums in this case - more than 21 million US dollars - which the artists brought together by selling a variety of preparatory artworks and former works. A more than thirty years lasting spadework was necessary for this project, too. After Jeanne-Claude's death, who died on 18 November 2009 at the age of 74 years due to a cerebral bleeding in New York, Christo kept on supporting the realisation of large-scale wrapping projects around the world, which he now realises single-handedly. Christo and Jeanne-Claude's spectacular and large-scale projects are designed for the present and the volatility, but not for eternity. They only unfold their impact in corresponding images, photographs, films, sketches and collages as well as in the memories of the people who attended the projects. Therefore, their oeuvre stands out due to genuinely environmental aesthetics that purposely refrain from leaving an objective and thereby burden some heritage for prosperity. 1982 Projekte in der Stadt – Städel Museum, Frankfurt a. M.
Christo & Jeanne-Claude. Fünf Filme, Albert Maysles/David Maysles, USA 2007, ’282. The Gates – Christo and Jeanne-Claude, Antonia Ferrera/Albert Maysles, USA 2007, ’98. Dem Deutschen Volke. Verhüllter Reichstag, Jörg Daniel Hissen/Wolfram Hissen, Germany 1996, ’90. Christo and Jeanne-Claude. in/out Studio, published by Matthias Koddenberg, Dortmund/New York 2015. Christo and Jeanne-Claude. Prints and Objects, published by Jörg Schellmarin, Ostfildern 2013. Christo and Jeanne-Claude. The Mastaba, Bildband, Cologne 2012. Christo und Jeanne-Claude. Grenzverlegung der Utopie, Text Werner Spies, Berlin 2010. Christo and Jeanne-Claude. Life=Works=Projects, Tokyo 2009. Christo and Jeanne-Claude. The Gates, Bildband, Cologne 005.